Matthew Paris, or Matthew of Paris, an English monk and chronicler known to us only through his voluminous writings. In spite of his surname, and of his knowledge of the French language, his attitude towards foreigners attests that he was of English birth. He may have studied at Paris in his youth, but the earliest fact which he records of himself is his admission as a monk at St. Albans in the year 1217. His life was mainly spent in this religious house. In 1248, however, he was sent to Norway as the bearer of a message from Louis IX of France to Haakon VI; he made himself so agreeable to the Norwegian sovereign that he was invited, a little later, to superintend the reformation of the Benedictine monastery of St. Benet Holme at Trondhjem. Apart from these missions, his activities were devoted to the composition of history, a pursuit for which the monks of St. Albans had long been famous. 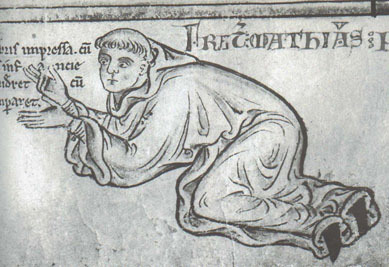 Matthew edited anew the works of Abbot John de Cella and Roger of Wendover, which in their altered form constitute the first part of his most important work, the Chronica majora. From 1235, the point at which Wendover dropped his pen, Matthew continued the history on the plan which his predecessors had followed. He derived much of his information from the letters of important personages, which he sometimes inserts, but much more from conversation with the eyewitnesses of events. Among his informants were Earl Richard of Cornwall and King Henry III. With the latter he appears to have been on terms of intimacy. The king knew that Matthew was writing a history, and showed some anxiety that it should be as exact as possible. In 1257, in the course of a week's visit to St. Albans, Henry kept the chronicler beside him night and day, "and guided my pen", says Paris, with much good will and diligence. It is therefore curious that the Chronica majora should give so unfavorable an account of the king's policy. Luard supposes that Matthew never intended his work to see the light in its present form, and many passages of the autograph have against them the note offendiculum, which shows that the writer understood the danger which he ran. On the other hand, unexpurgated copies were made in Matthew's lifetime; though the offending passages are duly omitted or softened in his abridgment of his longer work, the Historia Anglorum (written about 1253), the real sentiments of the author must have been an open secret. In any case there is no ground for the old theory that he was an official historiographer. Matthew Paris was unfortunate in living at a time when English politics were peculiarly involved and tedious. His talent is for narrative and description. Though he took a keen interest in the personal side of politics he has no claim to be considered a judge of character. His appreciations of his contemporaries throw more light on his own prejudices than on their aims and ideas. His work is always vigorous, but he imputes motives in the spirit of a partisan who never pauses to weigh the evidence or to take a comprehensive view of the situation. His redeeming feature is his generous admiration for strength of character, even when it goes along with a policy of which he disapproves. Thus he praises Robert Grosseteste, while he denounces Grosseteste's scheme of monastic reform. Matthew is a vehement supporter of the monastic orders against their rivals, the secular clergy and the mendicant friars. He is violently opposed to the court and the foreign favorites. He despises the king as a statesman, though for the man he has some kindly feeling. The frankness with which he attacks the court of Rome for its exactions is remarkable; so, too, is the intense nationalism which he displays in dealing with this topic. His faults of presentment are more often due to carelessness and narrow views than to deliberate purpose. But he is sometimes guilty of inserting rhetorical speeches which are not only fictitious, but also misleading as an account of the speaker's sentiments. In other cases he tampers with the documents which he inserts (as, for instance, with the text of Magna Carta). His chronology is, for a contemporary, inexact; and he occasionally inserts duplicate versions of the same incident in different places. Hence he must always be rigorously checked when other authorities exist and used with caution where he is our sole informant. Nonetheless, he gives a more vivid impression of his age than any other English chronicler; and it is a matter for regret that his great history breaks off in 1259, on the eve of the crowning struggle between Henry III and the baronage.